"Over a million children in New York — especially those in low-income communities and communities of color — depend on the meals served daily by their schools to be healthy, nutritious, and prepare them for learning," New York Attorney General Letitia James said in a statement announcing the lawsuit. Joining James in the lawsuit are the attorneys general of California, the District of Columbia, Illinois, Minnesota, New Mexico and Vermont. One week jam, the next global hunger and malnutrition. That’s the joy of Eat This Podcast; I get to present what interests me, in the hope that it interests you too. It also means I sometimes get to talk to my friends about how they see the big picture around food. Dr Jessica Fanzo, Assistant Professor of Nutrition at Columbia University’s Insitute of Human Nutrition, Special Advisor on Nutrition Policy at the Earth Institute’s Center on Globalization and Sustainable Development, also at Columbia, and much else besides, is one such friend. She was in Rome recently for a preparatory meeting for a big UN conference on nutrition next year, so I took the opportunity to catch up, and to ask some very basic questions about global hunger. I confess, I have very little time for the global talk shops that meet so that, somehow, magically, the poor can eat. And having attended a few, there does seem to be a dearth of people who have studied malnutrition and hunger first hand, and made a difference. 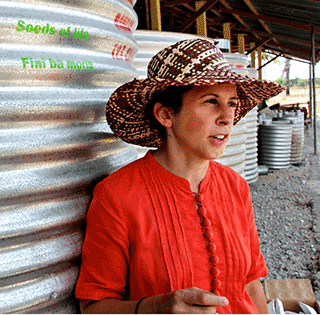 Jess Fanzo has been promoting the idea of nutrition-sensitive agriculture as a way to make a difference locally, while recognizing that there can be no simple, global solutions. You have to see what works in one place, and then adapt it to your own circumstances. There are no simple global solutions. The primary point – that governments have some responsibility for ensuring that their citizens at least have the opportunity to be well-nourished – seems often to be lost in the din of governments talking about other things. And interfering busybodies declaring war on hunger don’t seem to have much luck either. I don’t have any solutions. Check out Dr Fanzo’s credentials at the Institute of Human Nutrition and the Center for Globalization and Sustainable Development. She was also the first winner of the Premio Daniel Carasso; there’s a videoabout that too. The Integration of Nutrition into Extension and Advisory Services: A Synthesis of Experiences, Lessons, and Recommendations reports on ways to promote nutrition-sensitive agriculture. And the research extends to social media. The paper I mentioned, from the Potsdam Institute for Climate Impact Research, is Comparative impact of climatic and nonclimatic factors on global terrestrial carbon and water cycles. Photo of Jess Fanzo in Timor Leste by Nick Appleby. I love plumbing the archives of this podcast and relistening to old episodes. This is easily my second time around on this episode. Many certification schemes are blocking true sustainability by watering down standards in order to get stakeholders on board and even providing 'green cover' for firms that are destroying the environment, according to a report. I’ve always suspected things in this area weren’t great, but I didn’t know it was likely this horrific. 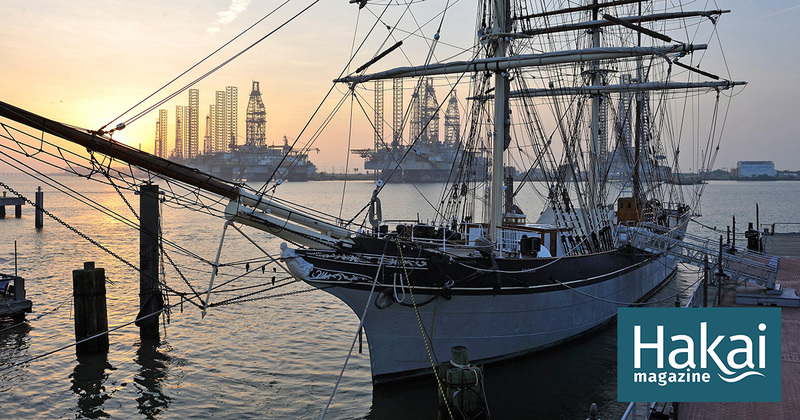 An unprecedented archaeology experiment is putting historical shipboard food and drink to the test. The future of food looks like lots of lobsters, Polish chardonnay and California coffee. This is a difficult story to tell, though the timelapse imagery here is relatively useful. If one had some extra money lying around, it certainly indicates which crops one could be shorting in the markets over the next few decades. I can imagine Jeremy Cherfas doing something interesting and more personalizing with this type of story via his fantastic interviews on Eat This Podcast. You can eat a perfectly nutritious diet for a lot less money than the US government says you need. But would you want to? Jeremy Cherfas interviews Parke Wilde, an agricultural economist at the Friedman School of Nutrition Science and Policy at Tufts University in Boston. I love that Jeremy raises the question of preparation time in discussing the Supplemental Nutrition Assistance Program (SNAP). It’s something that doesn’t seem most people would consider, but which in the modern world has become a major consideration. To some extent a lot of the growth of obesity in the U.S. is as a result of people going to restaurants and eating less healthy food out, but justifying it for the savings in time and the general convenience. Some of this discussion reminds me of a talk I saw back in August by Sam Polk, co-founder and CEO of Everytable, a for-profit social enterprise that sells fresh, healthy ready-to-eat meals affordable for all, and founder and Executive Director of Groceryships, a Los Angeles non-profit working at the intersection of poverty and obesity. He was also the author of the book For the Love of Money: A Memoir of Family, Addiction, and a Wall Street Trader’s Journey to Redefine Success. As I’m listening, I’m curious what these types of programs look like in other countries? How does the U.S. compare? Do those countries leverage the same types of research and come up with similar plans or are they drastically different? I’m thrilled that in the very last line of the episode, Jeremy indicates that he may explore this in the future. I’ll also guiltily admit that while listening to this episode, I was snacking on M&M chocolate candies while drinking a sugary supplemented beverage. Perhaps I’ll pay my penance later by baking a fresh loaf of bread. When the USDA denies WIC-program women, infants, and children their potatoes, in spite of the potato’s known excellence as a food, in spite of how much we all like it, I think I detect a subtly Euro-centric as well as classist message: “The right way to eat is like upper-class Europeans, not like New Worlders or peasants.” The problem is bigger than failing to recognize that Americans are not all Europeans, that even most European-Americans now embrace food traditions from many lands and cultures, and that most of us are closer to being peasants than to being medieval European royalty. To reject the potato is to be several hundred years out of date. Rejecting the potato represents a failure to learn some of the most important climate-change lessons of the Little Ice Age. 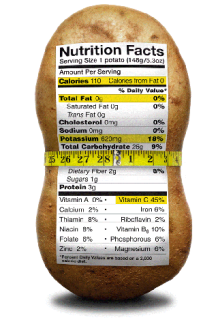 I think the USDA should revisit its potato policy. So do lots of other people, including potato growers, and although potatoes are again up for consideration, it isn’t clear whether this time they will make it onto the hallowed WIC list. In the meantime, they remain an excellent and nutritious food. The Effect of Food Restriction During War on Mortality in Copenhagen is Dr Mikkel Hindhede’s account, in the Journal of the American Medical Association, of the impact of the World War I blockade on deaths in Denmark. By encouraging Danes to switch to a more vegetarian diet, Hindhede effectively saved 6300 lives. Mortaility was actually lower during the blockade than before or after. 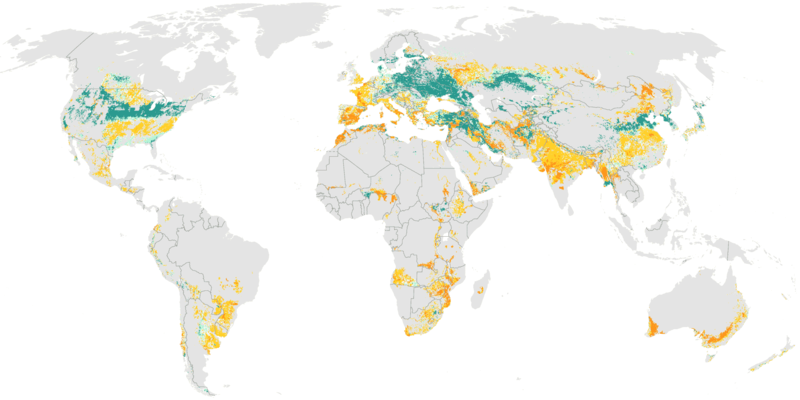 By contrast Germany, also affected by the blockade, saw widespread famine. There’s an online account of Chris Voigt’s 60-day 20-a-day potato marathon. It’s pretty broken. I hope to have more from Carol Deppe in a future podcast. Intro music by Dan-O at DanoSongs.com. It is even possible that Potato Pride is a genuine North Korean folk song? I remember hearing about the USDA potato controversy at the time, but never dug into the details. Jeremy Cherfas kindly lays out lots of interesting potato information in his interview here. Neanderthals did not descale their teeth regularly, for which modern scientists can be very thankful. 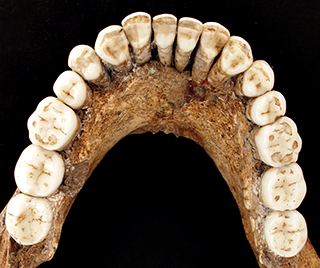 Embedded in the fossilized calculus, or tartar, on teeth from the Shanidar cave, in Iraqi Kurdistan, and elsewhere are some remarkable remains that are beginning to shed far more light on what Neanderthals ate. I don’t want to give too much away just yet. Let’s just say that if, like me, when you think of the Neanderthal diet you think of a bunch of cavemen and women sitting around chewing their way through a woolly mammoth, you’re in for a surprise. My guide through the recent discoveries on Neanderthal diet is John Speth, Emeritus Professor of Anthropology at the University of Michigan. Amanda Henry’s research clearly points to moist-cooked starch grains in the mouths of Neanderthals (but did they swallow?). Archaeologists, however, have found almost no evidence of Neanderthals using the hot-rocks boil-in-a-bag method of modern people who lack fire-proof containers. And surprisingly, they didn’t know what John Speth discovered while watching TV in a motel room: that it is perfectly possible to boil water in a flimsy container over a direct fire. In the interests of time I had to cut his fascinating description of an experiment to make maple syrup by boiling the sap in a birch-bark tray over an open fire, which concluded that it was “both efficient and worthwhile”. So, now that they know it can be done, how long before they discover it was done? There is evidence that Neanderthals ate moist-cooked starch. There is evidence that one can moist-cook without fire-proof containers and hot rocks. All we need now is evidence that Neanderthals used similar techniques, and the palaeo-dieters can add a nice mess of potage to their daily fare. National Geographic’s early report on Amanda Henry’s discovery of plant remains on Neanderthal teeth and a more recent report from the Smithsonian Museum of Natural History. More on Neanderthal diets at John Hawks’ weblog. Photograph of the Regourdou Neanderthal mandible used by permission of the photographer, Patrick Semal, and the Musée d’art et d’archéologie du Périgord. Final music played by Ljuben Dimkaroski on a replica of a Neanderthal bone flute found in a cave in western Slovenia. While I’ve read lots of research surrounding this area, this is the kind of area which more mainstream food journalists, entertainers, and educators could and should be covering. Aside from a semi-regular appearance of Deb Duchon, a nutritional anthropologist, appearing on Alton Brown‘s Good Eats, this may be one of the few places I’ve seen such an interesting interview of this type.